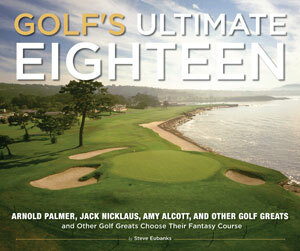 “Golf’s Ultimate Eighteen” follows in a long theme of golf books highlighting an eclectic grouping of eighteen “favorite” holes by high-profile golf professionals. This author’s grouping includes Palmer and Nicklaus along with a lone woman, LPGA member, Amy Alcott. I love such books and picking up the smartly illustrated piece, I eagerly started perusing it. What a disappointment. “Golf’s Ultimate Eighteen” may be the most poorly edited piece I have seen in many years. – Augusta National’s 12th hole features a mislabeled picture of the 13th green. – The picture of the 14th green at Muirfield Village is reversed as a mirror image. – A Ray Floyd quote regarding the 13th at Shinnecock Hills is inserted in the Kenny Perry section on the 14th at Muirfield Village. – The hole diagram of the tenth at Riviera twice mistakenly identifies an adjacent practice putting surface as the hole’s green. – Thirty-three separate words have no spacing between them. – The unlabeled picture depicting the 17th at The Old Course is actually of another hole, and the hole’s yardage listed is already out-of-date. It is 495 yards, not 461. I actually enjoyed the attractive pictures of the highlighted holes, and with this kind of compilation it is always fun to debate what holes are selected. I was surprised to discover the 13th hole at Shinnecock Hills (Ray Floyd) featured when there is the 13th at Augusta National, but remember that this was supposedly the player’s favorite holes. I have never seen the 13th hole at Shinnecock Hills highlighted in any work; it is usually the 14th at Shinnecock that is included among notable holes (or maybe the author couldn’t come up with a better hole choice from a celebrated player). Regardless, it was fun to see the hole examined for a change of pace. I was likewise surprised that no one picked the 8th at Pebble Beach, called by many the best or favorite par-four in the world. Otherwise, the inclusions pretty much include the usual suspects. Unfortunately, I found little if anything new in the text that hasn’t already been presented in the past. Next the binding, printing, and paper quality don’t, in my opinion, warrant the retail pricing of $34.95. Finally, as already mentioned, there are simply too many critical mistakes for me to recommend this book. I just came across this book in the store today and was baffled by all the errors. I can’t believe they put a picture of the 13th at Augusta for the 12th hole! I believe that kind of error should be punishable by a lengthy prison term.